VSA members flying from Williams typically use this page when they are planning to fly. A special page is sometimes used for weather links in other locations (see menu items: Other/ Other Wx). As a pilot using this page, you can see what the soaring conditions will be, thus enabling you to select the best day to fly, plan how long you will be in the air and how far you will travel. This is a page that should be a part of every pilot’s preflight. Interactive Map of observaion stations – Move mouse over locations on Map and select location. RASP is Dr Jack’s high resolution model, run by Andy Hogben -EH, for benefit of VSA pilots. I -PK used Dr Jacks standard menu page and updated it so it links to Andy’s products. RASP for Byron and south – be sure to look at the products under the “Loop” column – very impressive! – especially if you observe the convergence lines! How easy is to follow those lines? I hope it doesn’t take the ‘joy of discovery’ out of soaring for you. With those products, you can really decide where you may be capable of traveling to. BLIP Overview Page – Select “Regional Maps” for charts with descriptions. BLIP Viewer – For California and Nevada (Important Note: If you are not able to load an image from this link – first go to the above link (BLIPMAP Overview Page), and Register!, and then you will be able to use this shortcut link. NAM/ETA Model BLIPMAP – Scroll down on this page see NEWS, Info on registration, maps, etc, selection of products, descriptions, etc. Where is Williams on BLIPMAP? – Find San Francisco Bay Area, go up the coast line to Point Reyes (first little finger) and draw a line to NE border of California (where CA-NV-OR meet). WSC is on the west edge of the valley – a bit east of the first 500 ft contour line. For a second intercept line, find Lake Tahoe and draw a line from the extreme north shorline to Point Arena (the first point north of Point Reyes). Winds and Temps – Most recent data in graphic form – Select the time and altitude (includes forecasts and shows the entire USA). NCEP upper air charts – 16 day fcst at all levels. Use the /GFS model/ North America/ Loop All/ for 18Z, for whichever product you want to review. The 700 mb product is 10.000 ft and indicates heavy moisture in dark green, and has wind arrows. The 500 mb is 18,000 ft and indicates steering forces with vorticity in colors, and has wind arrows. wunderground.com/ – See the tab labeled “Maps and Radar” This service presents a wider variety of products and the “Aviation Maps” are in a different format than the UNIYSYS charts as listed above. High Res Visual Sat. Select both “Multiple” and “High/Large” Click on Ca. 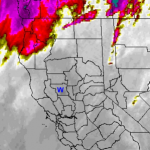 Latest 1 km Sat Photo Select Sacramento, San Francisco, or mouse-over the area you wish to see. Selection of Sat photos. Look at EPAC (Eastern Pacific) to see Northern California, and various others. High Res, composite Sat photo – NEXSAT chooseTrue color, latest is at top, click on thumbnail to see full page. Latest enhanced IR sat photo of USA (showing coldest in red, then yellow, green, grey, and warmest as black), with depiction of Surface Highs/ Lows/ Fronts/ Wind arrows, etc. Weather Underground Select various products. One more link to good resources. Weather Underground VacavilleSelect Wundermap on lower left for radar overlay . Summary of observations Select the location from a list available (Marysville-Yuba, Red Bluff, Sacramento-Intnl).